Common in Eurasia; a very rare visitor to eastern North America with about 15 records along the Atlantic Coast; from Delaware to Newfoundland in May to September. To find a Little Egret among Snowy Egrets: Look for long dangling head plumes (which all adult Little Egrets have, except when molting in fall, and all Snowy Egrets lack, (except for possible hybrids). Look for dark gray lores which will make the bill seem even longer; but not all Little Egrets have gray lores, so you will be likely to miss a few if you a just looking at lore color, and some very young Snowy Egrets have dark gray lores, so you will have a few false alarms. A Little Egret might also show more “stringy” breast plumes, slightly larger overall size and relatively heavier and longer bill, paler yellow iris, drabber facial skin, less extensive and drabber yellow on the feet, etc. But these are all subtle and overlapping. Follow the In depth links to read more. Several of these birds have generated considerable discussion, for example from Pennsylvania in 2008, and Texas in 1997 with an eventual consensus that they were most likely juvenile Snowy Egrets. A large percentage of Snowy Egret nestlings have blackish to gray bills and lores, while others have yellowish bills and lores. I have seen a few dark-lored juvenile Snowy Egrets from late July to late September, in the eastern US as well as California. The loral color of these birds was dark neutral gray to greenish-gray. They were all obviously recently-fledged, still retaining traces of down on close inspection. Clearly a few individuals retain the gray lores at least briefly after fledging, so it should be expected that a range of gray-green colors would be encountered. A critical first step in identifying these birds is determining their age (see below). If the bird is a juvenile, then dark gray loral color does not rule out Snowy Egret, and in fact it may be impossible to identify such birds in the field. If an egret with gray lores can be confirmed as an adult then that is a strong indicator that it is a Little Egret. These birds look like more or less typical Snowy Egrets except for a couple of very long head plumes. They may be hybrids, or they may be exceptional variants of Snowy Egret, either way they are an identification problem. Follow the In depth link for more discussion. These occasional dark-billed juvenile Cattle Egrets appear in August to November, and should be easily identified by overall size and shape, as well as their upland habitat. Plumage is always white, the only age-related and seasonal variation is in the presence or absence of ornamental plumes, and the color of bare parts. Plumes: Adults grow ornamental plumes once each year on head, breast, and back. These plumes grow slowly between January and March, become somewhat ragged by July-August, and fall out sometime in August-October. In other words plumes are in their full glory in March-June, and can be missing anytime from August to January. Bare parts of adults begin to brighten in January, reaching a peak of intense brightness in actively courting birds briefly in March-May, then fade slowly through the summer. Snowy Egret shows a matching cycle of color changes. All North American records presumably originate from the western European and African populations Egretta garzetta garzetta. Asian populations may differ slightly in size and or bare parts colors, and could potentially wander to North America, but would not be safely identifiable.Another subspecies is found in Australia. Whether or not Little Egret has a rare dark morph is under debate. 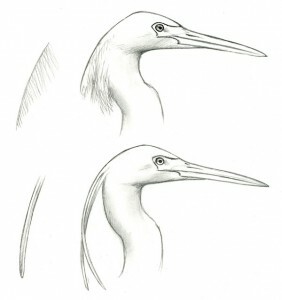 A few individuals identified as such in southern Europe and western Africa may have been Western Reef-Herons, or hybrids between Little Egret and Western Reef-Heron. Importantly, DNA evidence suggests that Little Egret and the western African populations of Western Reef-Heron Egretta gularis gularis are so closely related they could be the same species, and morphologically there is little to refute that idea. In that case Western Reef-Heron is simply a southern population of Little Egret, which is predominantly dark morph. Little X Snowy Egret – A mixed pair of Little and Snowy Egrets has been observed on Barbados and at least two apparent hybrids with Snowy Egret have been photographed in the northeastern US. For about the last year and order generic augmentin a half Ive been..
-I also have a pic in my archive from Trinidad of a Little Egret that has in the background a Snowy with a similar slaty head-plume, and I have recently seen (no pics) another one on the Texas coast. I mentioned this on ID-Frontiers and got no discussion except a private reply from someone who had seen a similar bird on the Florida coast. I wonder if this phenomenon is limited to the Caribbean Basin, and why it seems to have not been mentioned in any current literature that I am aware of – ?